San Diego Chargers at Cincinnati Bengals, Sunday, 1:05 p.m. The last time the Chargers lost was to these very Bengals, all the way back on December 1, in a 17-10 game that was more lopsided than the score might suggest. The Bengals knelt twice to end that game inside the San Diego 10-yard line in a contest where, honestly, they beat the Chargers up. Cincinnati is very capable of manhandling most teams on both sides of the line of scrimmage, and the likes of Andrew Whitworth and Brandon Thompson overwhelmed their beefy counterparts in the trenches. It’s not uncommon to see an offensive line seal off a running lane at the point of attack from both sides, but it is weird to see that happen six yards past the line of scrimmage. It was a brilliant, brutal performance. Yesterday, in writing about why the Chiefs might be able to flip the script from their previous loss to the Colts, it was easy to find tangible reasons why Kansas City’s ugly performance was unlikely to occur a second time. Not only is it likely to get Branden Albert and Justin Houston back from injuries, but it was really the only game all season in which the Chiefs played sloppy football. For the Chargers, while they’ve got King Dunlap back on the offensive line after missing him in that Bengals game, there’s just not much of a track record for them winning at the line of scrimmage. For the Chargers to win this game, they’re going to have to get a great team effort up front and hope their talented young players on the outside can win one-on-one battles. It’s going to be a tall order. San Diego’s strength as a team is with its skill-position players on offense, an underrated group that produced at an elite level all season long. San Diego’s passing offense ranked second in DVOA during the first half of the season, and its rushing attack jumped from 18th to fifth in the second half. That came about thanks to a heavier dose of Ryan Mathews, who was a monster during San Diego’s season-ending four-game winning streak. Over the final quarter of the season, Mathews carried the ball 107 times for 473 yards and three touchdowns. Nobody else in the NFL had more than 90 carries, and only LeSean McCoy produced more rushing yards over that time frame. It’s wrong to infer that the Chargers won solely because they decided to hand Mathews the rock, and he almost certainly got the ball that frequently because the Chargers were winning, but it’s also true that you’re pushing your team toward a W when you’re averaging nearly four and a half yards over that many carries without coughing up the ball. I’d be worried about Mathews doing that in the wild-card game just because the Chargers really didn’t give him any running lanes to get through; it took plenty of extra contortions and cuts from Mathews to get the most out of his traditional carries. His best play of the day back in December was actually on a draw when two Cincinnati linemen had pushed the guards blocking them three yards deep into the backfield. It was that kind of day. Where the Chargers should have more success, obviously, is in the passing game. Cincinnati’s pass defense is better than its rushing defense — it was fourth against the pass and 13th against the run — but injuries may have begun to weaken it there. The Bengals lost star defensive tackle Geno Atkins and cornerback Leon Hall for the season without skipping a beat, but they’re now also down fellow starting corner Terence Newman, who suited up for the first Chargers game but remains a question mark for Sunday’s tilt. That leaves the Bengals starting Adam Jones and Dre Kirkpatrick at cornerback, and while Kirkpatrick has a solid pedigree as a first-round pick out of Alabama, he has failed to live up to his professional expectations. He has looked competent since coming into the lineup for Newman three weeks ago, and he did have two picks against the Ravens (and a hobbled Joe Flacco) last week, but doing the same against Philip Rivers is a different story. The Bengals don’t normally move their cornerbacks around to account for the opposing team’s star receiver, so I’m willing to believe that the Chargers will spend much of the day with Keenan Allen on Kirkpatrick’s side of the field. Allen, the leading candidate for Offensive Rookie of the Year, is a critical part of the Chargers’ offense in so many ways. When the Chargers need a third-down conversion, they turn to Allen on a variety of slants and crossing routes; he had 22 third-down conversions this year, seventh in the league behind a bunch of players with tons more targets than him. When teams big-blitz Rivers, one of San Diego’s favorite hot routes is for Rivers to throw a jump ball up to Allen, who outmuscles opposing defensive backs for big catches. In that first matchup, the Chargers picked up a couple of third downs against the Bengals with that very tactic, forcing Cincinnati off those blitzes as the game went along. Cincinnati doesn’t have anybody who can cover Allen one-on-one, but then again, neither do about 25 other NFL teams. It’s critical that he has a big game for the Chargers. Their second weapon is Antonio Gates, who had a brutal time in Week 13. Gates fumbled away one catch to end an early Chargers drive, and later, he would have the ball ripped out of his hands by Kirkpatrick while attempting to complete a catch, resulting in an interception that was really more like a fumble. At this point, teams aren’t afraid of Gates; he’s still a talented receiver, but it’s fair to say that a decade of ankle and foot injuries has cost him a step or two. Instead, the guy who the Chargers will hope can produce a moment of magic is the team’s second tight end, Ladarius Green. Green is basically a lottery ticket at this point, a freak athlete in his second season out of Louisiana-Lafayette who ran a 4.53 40-yard dash at 240 pounds during the 2012 NFL combine. He’s going to be a terrorizing mismatch once the game slows down for him, and there are signs he might be figuring things out. After catching four passes as a rookie and seven more through the first nine games of the season, he had a three-game stretch with nine catches for 206 yards and two touchdowns, including a 30-yard touchdown pass up the seam against these very Bengals that exhibits how dangerous he can be. Playing in Cover 2, the Bengals know this sort of pass up the seam is coming, and they try to position their gifted, rangy linebackers in lanes to prevent the completion. It just isn’t enough. Green is too fast off the line for the Bengals to properly account for his depth, and after a play-action fake, Rivers is able to rocket in a pass that Rey Maualuga had no prayer of touching. That’s what Green can do for San Diego. Then again, he has just one catch during this four-game winning streak, which is why he’s a lottery ticket. The Bengals are well positioned to fight off that run of tight ends; they’ll likely spend most of their time in the nickel, with linebackers Maualuga and Vontaze Burfict and safety Reggie Nelson matching up against Gates and Green. They’ll try to jam Green at the line of scrimmage to prevent him from getting into his routes, and their defenders are fast enough to stick with Gates stride-for-stride. And if their front four keeps winning against San Diego’s offensive line, the back seven won’t be particularly concerned about getting up at the line of scrimmage to defend against the run, which will help limit the damage done by San Diego with play-action. It’s not impossible to imagine the San Diego receivers piecing together a great game and winning these matchups, but if the Bengals can beat the Chargers at the line of scrimmage, the odds will favor the Cincinnati defenders. It’s fair to say that Andy Dalton’s postseason career hasn’t exactly been covered in glory. In two starts, both in Houston against the Texans, Dalton completed 57 percent of his passes while averaging 5.3 yards per attempt, and he threw four interceptions without tossing a single touchdown. He has been better during the regular season, but he is still prone to games in which he fails to make adjustments and forces dangerous throws. In fact, he doesn’t appear to be maturing in that sense whatsoever. 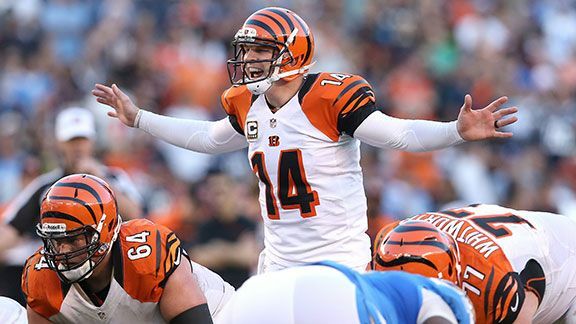 Dalton had three three-interception games this season; only Eli Manning had more.1 Dalton’s interception rate rose for the third consecutive season, and he finished with 20 interceptions. That isn’t to say Dalton isn’t growing whatsoever. His yards per attempt and passer rating grew for the third consecutive season, his completion percentage remains slightly above league average, his sack rate remains low, and he threw a kinda-stunning 33 touchdowns this season. Cherry-pick samples and you can find a three-game stretch in which he threw 11 touchdowns against two interceptions … and then followed that with a four-game run in which he threw six touchdowns against nine picks. Dalton isn’t a bad quarterback, but he is certainly an inconsistent one. And while a high-variance quarterback can put together a lights-out four-game stretch and win the Super Bowl when everything goes right,2 he’s also more likely to come out of nowhere with a horrible performance that kills his team’s chances of winning a game. The Chargers need to spin the Dalton Wheel and hope it lands on a bad day. San Diego did lure Dalton into one ugly interception by masking the fact that Eric Weddle was playing center field and offering safety support on what appeared to be single coverage on A.J. Green, but that’s not enough. The Chargers need to help their own cause by avoiding mental mistakes and fighting through the play design of the always clever Jay Gruden. During the last Chargers-Bengals game, San Diego really had trouble dealing with Cincinnati when it would line up in bunch formations and run a variety of pick plays or feigned pick plays from the same spot. One such play led to a wide-open touchdown catch for Green when nobody followed his route into the end zone. Cincinnati would later get a key catch-and-run from Andrew Hawkins off a similar route combination. The Chargers are mostly young and inexperienced at linebacker and in the secondary, so it’s key that they somehow find a way to stay with their assigned men in coverage and weave through those tangled routes. One other way to try to help make Dalton have a bad day: Get a hand on him. The Chargers failed to sack or even knock Dalton down once during that first game, and while he only threw 23 passes, the Chargers only really pressured him on two occasions. Defensive coordinator John Pagano has to do more to get after Dalton on Sunday. It seems unlikely that Cincinnati’s talented offensive line will blow many assignments in pass protection, but the Chargers could get a boost if left tackle Anthony Collins misses the game with an ankle injury. That would likely push Whitworth, who had a dominant game at guard during the first contest, back out to his traditional spot at left tackle, creating a hole again at guard that would likely be filled by Colts cast-off Mike Pollak. Chargers’ Path to Victory III: What If the Bengals Aren’t Great at Home After All? Yesterday, I wrote about the Saints, an 8-0 home team forced to travel away from their power base in the first round of the playoffs. The Bengals aren’t quite as obviously a team built to succeed in their home confines, but they went 8-0 at home for the first time since 1988, a year they finished by winning two more playoff games at home before losing Super Bowl XXIII on a neutral field to the 49ers. The Bengals didn’t exactly play a tough schedule in 2013, but they did still manage to beat the Patriots, Colts, Ravens, and Packers during their undefeated home run. Unless the Broncos lose in the divisional round, this will be Cincinnati’s final home game of the season. Undefeated home teams don’t suddenly start losing in the playoffs, right? That’s right, five of the last 10 teams to go 8-0 at home during the regular season promptly lost their first home game during the postseason. You can probably figure out why: The competition gets harder and an eight-game sample just doesn’t say very much about anything. There’s nothing inherently meaningful about going undefeated at home;4 a team can go 7-1 and still have its home stadium be a “fortress,” as I suspect the Seahawks believe their home digs to be. It also seems silly to suggest you’re unbeatable in your home ballpark when you haven’t even sold the thing out yet. The Bengals (as well as the Colts and Packers) were still several thousand tickets short of a sellout on Thursday night. The Colts managed to sell their remaining tickets on Friday, and thanks to a league extension will have their blackout lifted. However, Cincinnati is still a question mark and the league will almost surely urge ownership to buy up any remaining tickets before game day to ensure that the city doesn’t endure an ignominious local playoff blackout, a very interesting story line amid the new FCC discussion surrounding the sports blackout rule. In any case, while the Bengals will be happy to play at home Sunday, it’s not exactly the terrifying enclave their 2013 home record suggests. The battle up front will be the most important matchup of all. If the Bengals can knock the Chargers up, down, and around in the trenches, I honestly can’t imagine the Chargers winning this game. Their defense isn’t good enough to stop the Bengals from running the football if the offensive line gets going, and it will take a perfect game from Rivers to win if his offensive line can’t keep the Bengals at bay. Then again, it basically required a perfect month from the Chargers (and the teams around them) to get San Diego into the playoffs, and that’s exactly what happened, so you would forgive the Chargers for feeling like they shouldn’t be counted out right about now. San Francisco 49ers at Green Bay Packers, Sunday, 4:40 p.m. If you had told Packers fans on Thanksgiving night that they would still manage to squeak their way into the playoffs with a healthy Aaron Rodgers, they would have been delighted. If you had told them they had to play the 49ers in the first round, well, you might not have gotten exactly the same reaction. San Francisco has had Green Bay’s number under Jim Harbaugh, winning three games over the past two seasons. That began on the opening weekend of the 2012 season, with the 49ers traveling to Green Bay and physically overwhelming the Packers in a game that took a bizarre Randall Cobb punt return to finish within one score at 30-22. In the divisional round of last year’s playoffs, the Packers famously got stomped by the read-option, with quarterback Colin Kaepernick running for 181 yards in a 45-31 blowout that only looked close because of a meaningless late Packers score. Finally, the Packers battled back in a closer game at Candlestick during the opening week of this campaign, but Anquan Boldin’s 208-yard day was enough for the 49ers to launch a fourth-quarter comeback and prevail, 34-28. You often hear that it’s hard to beat the same team twice in a season. Well, is it hard to beat the same team four times in two years? I guess it depends on how you phrase the question. It’s certainly not impossible for a team to win four games against another team across two years; it happens all the time, but usually it’s when a consistently great team gets to beat up on an ugly sibling within its division twice a year. That’s not really a fair comparison here, since the 49ers beating the Packers four times in two years isn’t the same thing as, say, Peyton Manning and the Broncos stomping out a hopeless Raiders team. So let’s rephrase the question. Is it hard for one playoff team to beat another playoff team four times in a row over two years? The evidence doesn’t seem to point to any conclusions. By my count, there are seven situations since 1990 when one playoff team has won three consecutive games over another playoff team over a two-year stretch (including, of course, their playoff games). In that fourth game, the dominant team has won four out of seven times.5 That includes one series that, sadly, Packers fans might remember well. The Packers lost six consecutive games to the Cowboys over the 1993, 1994, and 1995 seasons, losing their regular-season game to Dallas before being knocked out of the playoffs by the same Cowboys each year. A decade later, the Colts lost four consecutive games to the Patriots before beating Tom Brady three consecutive times themselves, including the famous 38-34 playoff comeback win. It’s too small of a sample to say anything, but there’s certainly no evidence confirming that the Packers will have no hope of overcoming their three-game losing streak against Harbaugh’s 49ers. There’s not enough evidence here to suggest that “having a team’s number” means very much. That’s the good news. The bad news? They still have to come up with a way to beat the 49ers, who have badly outsmarted the Packers during their last two contests. While Alex Smith outpointed Aaron Rodgers in Week 1 of the 2012 campaign, the 49ers eventually replaced him with Kaepernick before the rematch in last year’s playoffs. After giving Kaepernick occasional reps in the read-option for most of the regular season, the 49ers took the tactic out of their playbook over the final two weeks of the regular season before unleashing it upon an unsuspecting Packers team in the playoffs in spectacular fashion, running it 16 times for 176 yards and a touchdown. Britches sufficiently burned, the Packers swore they wouldn’t lose to the read-option again when they opened up against the 49ers (and then Washington) to start the 2013 season. They sent their defensive staff to Texas A&M to study the read-option in the hopes of understanding how to stop it. Having drilled all the angles and coached up their defense throughout training camp to stop the zone-read, the Packers came out fully prepared for Week 1 and held the 49ers to 10 rushing yards across seven zone-read plays.6 Unfortunately, the 49ers ran 66 other plays that day and averaged 7.3 yards per snap on them, with Kaepernick throwing for 412 yards and three touchdowns. Oops. So, having been through the read-option wars, only to fall victim to a stunning passing display, why should anybody believe that the Packers have any prayer of slowing down the San Francisco offense in this playoff game? 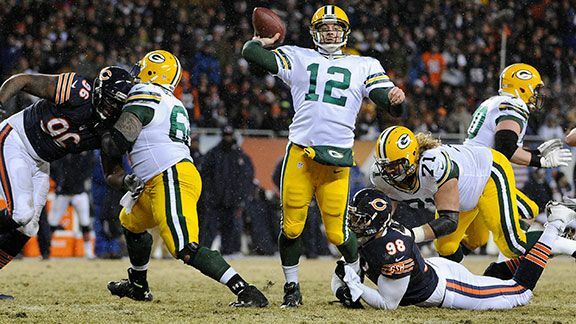 Well, if you’re a Packers fan looking for hope, it should start with the other 15 games of the 2013 season. While Kaepernick had a solid season during his first full year as the starting 49ers quarterback, he was neither the terrifying runner nor the pinpoint answer his starts against the Packers purported him to be. Kaepernick averaged just less than 33 rushing yards per game this year, and after his 412-yard passing outburst in Week 1, he finished up with just less than 186 passing yards per game across his final 15 games. Boldin looked like the biggest bargain of the offseason after his 208-yard opener against Green Bay, but he came down to earth the following week, when Richard Sherman held him to one catch for seven yards. Boldin didn’t have another 100-yard game until Week 17, when he caught nine passes for 149 yards against the Cardinals. San Francisco’s passing attack was essentially a two-man game7 with Boldin and Vernon Davis until Michael Crabtree returned, and even then, Crabtree has had a relatively quiet 19 catches for 284 yards in his five-game audition for the playoffs. He should be getting better with each week, but he’s still rusty and recovering from his torn Achilles. This should also be the most effective secondary Kaepernick faces during his Packers conquests. In Week 1, the Packers were missing two starters in cornerback Casey Hayward and safety Morgan Burnett. Hayward is on injured reserve with a hamstring injury, but Burnett is safely ensconced in the lineup, and he’s a better player than Jerron McMillian, who was released by the Packers in December. Green Bay has also turned Mike Neal into a worthwhile every-down linebacker after playing him in a rotational role early in the season; he should offer more as a run defender than Erik Walden did a year ago. Clay Matthews is out, which obviously doesn’t help matters, but the Packers have gotten more from rookie Andy Mulumba as the season has gone along. It wouldn’t be a surprise to see Mulumba play ahead of 2012 first-rounder Nick Perry on Sunday, as Perry was removed from the game (either because of a foot complaint or poor play or, likely, both) twice during the win over the Bears last week. And I don’t want to suggest that the Packers are due for a takeaway against the 49ers, but it’s pretty incredible that Green Bay has had so much difficulty getting the ball away from the San Francisco offense. The Packers have lost the turnover battle five to one over these three recent Green Bay–San Francisco tilts, and while that one takeaway was a Sam Shields pick-six on the opening drive of last year’s playoff game, the Packers just haven’t been able to create big plays on defense. It’s really important to keep competitive with the 49ers in terms of the turnover margin, too. The 49ers are now 38-4-1 under Harbaugh when they win or tie the turnover battle and 1-9 when they lose it. Everyone does better when they win the turnover battle, but Harbaugh’s 49ers are an extreme case. One issue the 49ers still need to adapt to is the absence of fullback Bruce Miller. An underrated part of the 49ers offense in the way that fullbacks are inherently and consistently underrated, Miller was both a checkdown target in the passing game and a reliable lead blocker on the ground. He went down with a shoulder injury against the Buccaneers in Week 15 and is now on injured reserve, so his season is over. The 49ers tried to replace him with former Stanford fullback Owen Marecic, only to find that Marecic had moved on from football; that left the 49ers with converted halfback Anthony Dixon and Will Tukuafu, formerly a 293-pound defensive end at Oregon. The 49ers place more of an emphasis on using the fullback than any other team I can think of. San Francisco ran the ball 374 times this year in a two-back set (per ESPN Stats & Information), which is 120 times more than any other team. In many cases, that was Miller blocking for either Frank Gore or Kendall Hunter. To contrast, only one team in football runs out of a single-back set less frequently than the 49ers, and that’s the Saints. So, replacing a respected fullback with a pair of projects should reduce the effectiveness of your running game. That makes sense. It also hasn’t happened for the 49ers. 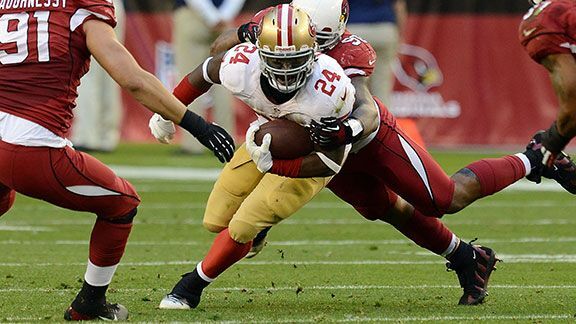 Through the Bucs game, the 49ers averaged 4.1 yards per carry in their two-back sets. They’ve run the ball 32 times in two-back sets since Miller went on IR, and those carries have produced 167 rushing yards. The sample is small enough that a single 45-yard run makes up the difference between the Miller-led attack and the new effort, but even coming close to their former exploits would be good enough for the 49ers without Miller. ESPN Stats & Information also notes that the 49ers managed to keep their running backs untouched for an average of 2.6 yards before first contact per run play with Miller in the lineup; with Dixon and Tukuafu, that figure is up past four untouched yards per play. It seems like Dixon is winning the battle so far, but if the 49ers can keep defenders off their backs and smash out holes at the line of scrimmage for their backs to run through, I don’t think they will care whether Dixon or Tukuafu becomes the full-time fullback for Gore. The other injury that might cause problems for the 49ers is that of Carlos Rogers, who went down with a hamstring injury during the Cardinals game in Week 17. Rogers is questionable for Sunday, and his absence would create a hole in the slot for the Niners, who are already thin at cornerback after Nnamdi Asomugha washed out. It would likely create a role for veteran Eric Wright, who has played just 117 defensive snaps all season. Factors for each side. For the Packers, can they finally muster a two-takeaway day against Kaepernick & Co.? Can B.J. Raji, who had a horrible day last year against the read-option, hold his own up front against arguably the league’s best interior line? (It would sure be nice for Raji, who is at the end of a contract year.) Will the Packers gain a competitive advantage in a game in which the temperature at kickoff is likely to approach negative 12 degrees? Is Rodgers 100 percent after his collarbone injury, or will the rustiness we saw during the first three quarters of the Bears game continue to rear its head in this contest? And is Eddie Lacy, who is still struggling with an ankle injury after a meaningless halftime draw a few weeks ago, going to cut at anywhere near 100 percent? Can Mike McCarthy somehow avoid being outcoached in terms of in-game strategy by Harbaugh? No to that last one? OK. It seems a little clearer for the 49ers. Will they beat themselves? Is Crabtree ready to be a threatening receiver, even if he’s not back to his former self? If Rodgers is on, can Kaepernick keep up? In negative-12-degree weather? Will they get the old Aldon Smith as opposed to the erratic, inconsistent guy who has been on the field since returning from rehab? Oh, and do they have another trick up their sleeve that they’ve been saving for the overmatched Packers? My suspicion is that they don’t have one — or need one, either. What’s the opposite of a sigh? The 2012 Seahawks were 8-0 at home and made the playoffs, but did not host a playoff game. On the whole, 8-0 home teams do have a higher playoff win percentage at home (.728) than non-8-0 teams in their home playoff games (.664), but that’s also biased to the extent that an 8-0 team is likely to be better than one that lost a game at home. Those 8-0 home teams, in a small sample, are also noticeably better in their playoff travels on the road than your typical playoff team. One of those doesn’t really fit into the whole idea of dominance; the Seahawks beat the Rams at the beginning of the 2003 season and then lost four straight to them through the end of the 2004 playoffs. Per ESPN Stats & Information, the Packers would end up seeing 30 more zone-read runs over the rest of the season, upon which they allowed 5.6 yards per carry. The 49ers would finish the year having run 68 read-option plays while only averaging 3.5 yards per carry, the lowest yards per attempt figure for any team that ran the zone-read more than 10 times all season. In all, the NFL ran 1,199 read-option carries this year while averaging 5.0 yards on those plays. That is about three times as many zone-read plays as were run a year ago, but the additional usage came with decreased efficiency, since the read-option averaged 6.2 yards per carry in 2012. No, really. 49ers receiving touchdowns this year: Vernon Davis (13), Anquan Boldin (7), Michael Crabtree (1).